This backdoor is dropped by the malicious .PDF file attached to spammed messages related to the death of the late Korean leader, Kim Jong-il. This backdoor connects to its C&C server using the parameter. If the backdoor connection is successful, it may perform the certain routines. 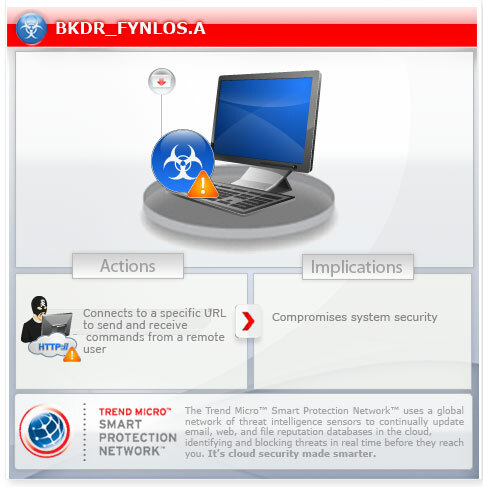 Scan your computer with your Trend Micro product to delete files detected as BKDR_FYNLOS.A. If the detected files have already been cleaned, deleted, or quarantined by your Trend Micro product, no further step is required. You may opt to simply delete the quarantined files. Please check this Knowledge Base page for more information.